The GOP tax bill creates a vast and easy game for accountants to play. There are many reasons that the GOP tax overhaul will be unpopular. It increases the national debt by more than $1 trillion, while still raising taxes on millions of people. For most individuals who will see cuts, the benefits are small and temporary, while the savings for corporations are expansive and permanent. Yet what will infuriate people the most is the staggering unfairness of the bill’s many loopholes. The revamped tax code will create a vast and easy game for accountants to play. The newest hide-the-money strategy will be to create a so-called pass-through business—a company whose income is passed through to the owner as profit. As the Brookings Institution’s Adam Looney notes, “People doing the same exact job for the same exact pay [will end up] paying 30 to 40 percent more in taxes if they’re paid in wages rather than profits.” As a result, many will rush to claim their income as profit from their own business. And because this benefit increases the more income you make, professionals in finance, medicine, law, and other elite jobs will go to the furthest lengths to do this. Kansans were livid when University of Kansas basketball coach Bill Self, the state’s highest-paid employee, formed a company to avoid paying state taxes on almost his entire salary. That Republican tax plan will now extend that to the whole country. The second problem is that the IRS has been defunded and drained of personnel for years. It also has very little time to fix any of these problems, and will be working at a breakneck pace to try and provide guidance for these new rules. At the same time, the IRS’s enforcement division has been disproportionately hit by funding and staffing reductions. Since 2010, the IRS has lost nearly a quarter of its enforcement staff. An underfunded IRS won’t just be ineffective; it will undermine the public’s trust that tax laws will be fairly enforced. 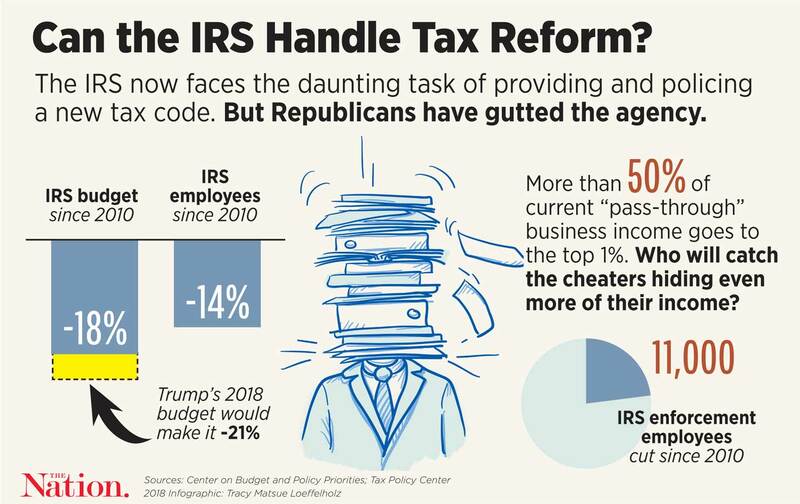 But even with enough resources and time, the people Trump will likely appoint to head the IRS are unlikely to rigorously enforce these regulations anyway. The new interim head of the IRS, David Kautter, oversaw a team at the consulting firm Ernst & Young known as Viper, designed to help the rich hide their wealth from US taxation. It is possible that Kautter could use his knowledge to fight and close loopholes; but given every single other aspect of the Trump administration, this seems highly improbable. People find the runaway incomes at the very top to be unfair. But what people hate even more is the idea of someone getting away with something. Unfortunately for us all, this tax code will only lead to more of both types of injustice.